Sell your VOLKER KRIEGEL items on eBay ! Volker was somewhat of a pioneer in Germany when it came to Fusion. An extraordinary guitarist who on this his debut has surrounded himself with some incredible musicians.Volker also plays sitar on here although there's very little of it on this 1971 release. This isn't the most dynamic album i've ever heard, in fact it's pretty straight forward a lot of the time. We get a percussionist besides the drummer adding lots of intricate sounds. "Zoom" opens with percussion as the sitar comes in breifly. Drums, bass and electric piano follow.The guitar starts to solo tastefully over the top. Electric piano replaces the guitar 3 1/2 minutes in then the sitar returns. "So Long, For Now" is laid back and very jazzy. "More About D" opens with some atmosphere. I like the electric piano. It does pick up before 1 1/2 minutes. Nice. Some craziness follows then the bass, drums and guitar lead.The electric piano is back. It settles before 7 minutes and the bass leads. "Suspicious Child, Growing Up" is a cool song with intricate guitar, electric piano, bass and drums. I like this laid back tune a lot. "Instant Judgement" has some intensity to it and is more uptempo.The guitar leads early then the electric piano leads 2 minutes in.The guitar returns late to lead. "Ach Kina" is mellow and slow paced. It does pick up some late. "Strings Revisited" has these intricate sounds that come and go. Electric piano leads 2 1/2 minutes in then it's the guitars' turn after 4 minutes. Drums and percussion take their turn after 6 minutes. A low 4 stars for this early German Fusion album. 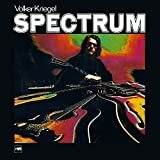 Post a review of VOLKER KRIEGEL "Spectrum"